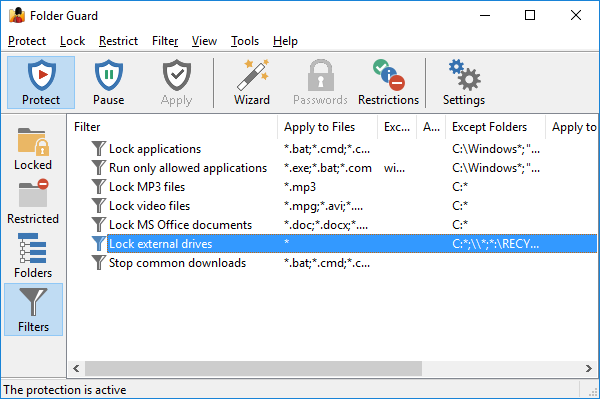 Previously we’ve shown how easy it was to set up Folder Guard to prevent downloads of programs from the Internet. As a side effect, the filter that accomplished that task prevented running programs from the removable drives, as well. However, what if you want to stop users of your computer from using the external drives at all? For example, what if you don’t want them to copy documents and files from the computer to the removable drives they could bring with them? With Folder Guard, it’s easy to achieve that. The most important part of this filter is the content of the Except folders box: it contains the mask C:*;\\*;*:\RECYCLE.BIN . Why it is there? 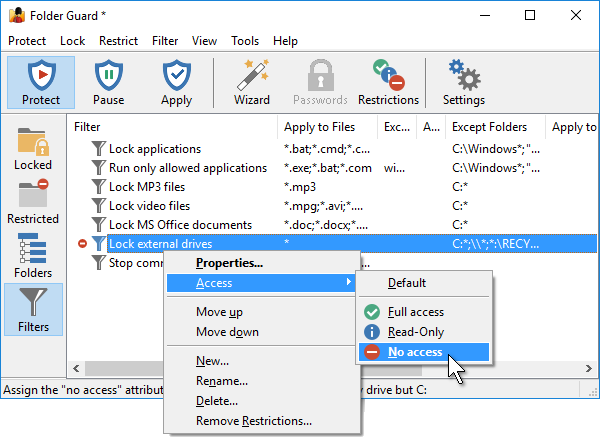 Because we don’t want the restrictions that this filter would create to apply to the files located on the main drive of your computer (which is most probably the drive C:). We only want the restrictions to apply to other drives, which would have drive letters other than C:. The star character (*) in the mask means any set of characters, so the mask C:* would match any folder located on the C: drive. As a result, the filter would not apply to any file or folder on the C: drive, just what we want. We also don’t want the filter to apply to the network files. Since the paths of such files usually start with the double-backslash, we use the mask \\* to specify such paths. Finally, we’ve added the mask *:\RECYCLE.BIN to the Except forders box. 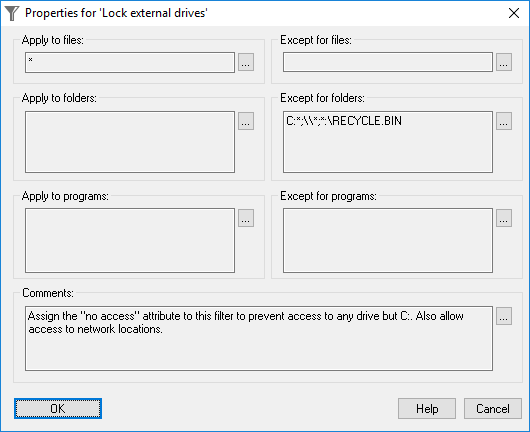 It is necessary to prevent the filter from applying to the files located in the Recycle Bin folders. Without such a mask, Windows would be denied access to Recycle Bin, and it would cause it to display messages about it being corrupted. What if at some point you do need to access a removable drive? 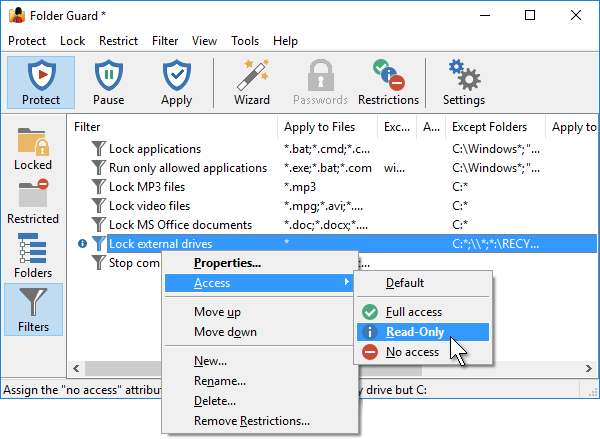 Just pause the protection of Folder Guard, perform the task, then resume the protection back (no Windows restart required).